Home » Home Fitness Equipment » The Best Treadmill for you…Portable? The Best Treadmill for you…Portable? Starting and sticking to an exercise routine is already tough. Add to that having to squeeze time into an already tight schedule and you are going to have a much harder time. If you have a hectic lifestyle, like so many of us do, it may be hard to find time to make it to the gym, but having a few home gym machines can allow you to lose weight and stick to your exercise regimen within the comfort and privacy of your home or apartment. A treadmill is a necessity in any home gym. They provide one of the best workouts you can come by for better heart and cardiovascular health and are great for helping you lose weight, but many people think they just don’t have room for a the huge pieces of equipment that they see in gyms and on TV. This may be true, but a portable treadmill alleviates this concern because they made for those individuals who live in small spaces. This is one major benefit of buying a portable treadmill rather than a traditional one. If you live in an apartment or condo, or just don’t have an extra room in your home to dedicate to a home gym, these machines can be the perfect solution. They are easily folded and movable to get out of the way when they are not being used. If you are always on the go or move often, a portable treadmill would also be great for you because of their portability. This makes them much easier to move than a traditional electric treadmill would be. They can easily fit into the back of a truck or SUV for easy transport to a new location. Also, most portable treadmills can be purchased at a fraction of the cost of traditional gym machines. When these types of treadmills first came out, many of them were poor quality and offered very few features compared to other machines. However, they have gotten much better on the performance scale, and many offer the same benefits as traditional models, but at a fraction of the cost. This is one of the greatest benefits. If you think that a portable treadmill might be right for your home, make sure to do your research and find the best model for your. Read portable treadmill reviews and compare different models and features. 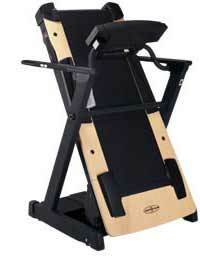 You will enjoy the convenience that these machines can provide while you get fit in your own home.